Life lurches on in Greece. Moody's has lifted the country's credit rating marginally, but this will make no difference to your average Spiro and Maria, who face yet another hard winter. Troubles with the powers that be in Europe continue, unemployment rates remain high, young people are leaving the country in droves, and doctors and hospital staff are all set for another strike. Fascist Golden Dawn is still popular, and in the provinces the olive harvest, such a vital part of the rural economy and individual psychological wellbeing, has been disappointing. 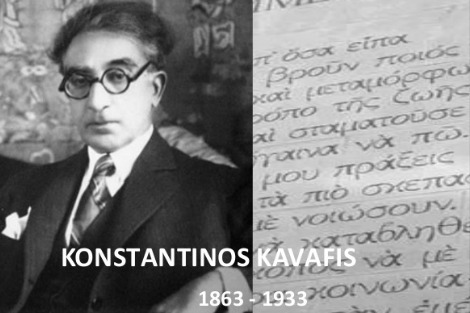 So it is cheering to have a little relief, along with a reminder that today's Greeks, like their forefathers, have a sense of rightness and proportion: 2013 has been declared the year of poet Konstantine Kavafis (anglicised as Constantine Cavafy). Like Shakespeare's, Kavafis' span displayed an unnatural symmetry, in that he died on his birthday. This year marks the 150th anniversary of his birth, and the 80th anniversary of his death. I knew nothing about Kavafis until I came to Greece, but his presence in my mental and literary life is one of the many presents migration has given me. He was part of the cultivated Greek diaspora in Alexandria, where he spent most of his life working at his day jobs: those of journalist and civil servant. But in his creativity and spare time he was a relentless perfectionist who polished and reworked his 154 poems, which were read initially only by his friends: his fame came posthumously, and continues to increase. Poets do not see it as their business to instruct, yet inevitably readers learn from them. When reading Kavafis' 'Voices', I learned once again about loss. 'Candles' teaches the reader about time and old age, 'Ithaka' about life's journey, and 'The City' about the patterns in living we seem doomed to repeat: no matter where we travel, we will return to the same metaphorical city and ruin our lives in exactly the same way we did at first. Then there's 'Waiting for the Barbarians', possibly Kavafis' most famous poem. In it, citizens are doing nothing: they are waiting. The Senators are waiting for the Barbarians to come and make the laws, and the Emperor is also ready for their arrival. He is dressed and bejewelled, as are the consuls and praetors: all are ready to dazzle the Barbarians. The renowned public speakers, the rhetoricians, however, are silent, because the coming Barbarians are bored by such practices. And now, what will happen without the Barbarians? These people were a kind of solution. I cannot claim to think about Kavafis' poetry every day, but sometimes it connects with events or comments. Such was the case recently, when I read an online interview with Noam Chomsky, who asserts that America is a terrified country, but that much fear is of 'the concocted enemy'. He maintains that there are all sorts of things concocted for Americans to be frightened about, and points out that 'the whole terror system' is making enemies faster than it is killing suspects: he deplores both happenings. Chomsky maintains that there is much distracting and scaremongering talk in America about the deficit, but that most people prefer to discuss the lack of jobs. Inevitably, he also comments on immigration: 'If you're worried about immigration, let's take a look at why people are coming, and what our responsibility is, and what we can do about it.' Taking a look is not usually a Greek response, and other countries, Australia included, seem to wear a variety of blinkers, or else turn a blind eye to the complexity of the problem. The comments on the interview were mostly sane and sensible. One person said: 'No nation can ever be perfectly safe, so there will always be those who exploit insecurity.' Politicians mostly, it seems to me. Everywhere. And there are those who will always try to escape responsibility. Kavafis knew it was, and is, often easier to sit around and wait for the Barbarians. But waiting cannot last forever, so then what? Thanks Gillian, I am also a fan of Kavafis and agree that Waiting for the Barbarians is a poem for our times, and like all great poetry, for all times. I love reading your occasional pieces from Greece - how dispiriting it is to see what has befallen this country we love so much…all the best. I look forward to future pieces. I enjoyed your comments about Cavafy. I believe he brings up a good point: What would happen if there were no more Barbarians coming to Greece. It would then cause great chaos. Who would the Greeks have to blame for their unfortunate situation? As you know, all bad things that may happen in Greece are the result of conspiracies from outside-- dark forces. That poor Greece is a feather in the wind blown here and there by selfish conspirators looking after their own interests. If the Barbarians stopped coming to Greece then the Greeks would have to look to themselves to understand the source of their problems and lay the blame where it really belongs. That there are no more Barbarians perhaps would be a good thing for Greeks. I believe Greeks are smart enough and strong enough to provide solutions to their woes. Perhaps Barbarians would no longer figure into the equation and Greeks could take the control they so long to have. I think what you are pointing out Gillian, using Kafavis and Chomsky, is that we are a psychologically unintegrated society which has not come to terms with its own collective fear. This fear can lead to the group lethargy Kafavis describes or it can lead to the terrible counterproductive intervention of Western nations in the Muslim World. Neither solution is satisfactory. What then? Jung thought if enough individuals worked to integrate and thereby change themselves they might ultimately change the world. What Jung called "inner work" takes place out of sight and requires long term continuous effort. It is not an easy task and in a world of instant coffee and instant everything most people put it in the "too hard" basket. It is not necessarily an overtly sectarian religious task but a spiritual one in the widest sense of spirituality which includes all religions and unbelief . Without being melodramatic I would posit that its realisation by enough people might genuinely save humanity. It is a task to be achieved not another topic for endless discussion by the opinionati. You are right to have raised the question. Thank you. Thank you Gillian for once again bringing sensitivity, understanding and compassion in examining the challenges that ever confront us. I share your admiration for the great poet Cavafy (Kavafis) and lean to Ithaka as his great poem: Keep Ithaka always in your mind. Arriving there is what you're destined for. But don't hurry ..... better if it lasts for years. Gillian your comments relating what Kavafis' poetry tells about life yesterday, certainly today and probably tomorrow are further examples of your wisdom and clarity of thought. Many thanks. Thank you Gillian once again for your spotlight of wisdom. Kavafis certainly not only has something profound to sat to Greeks, but to the whole of mankind.